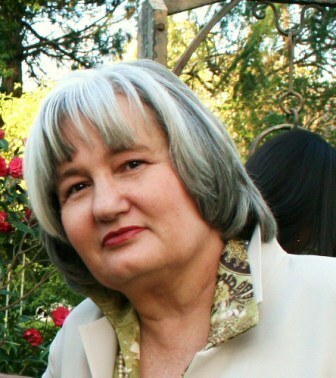 My name is Karen Robinson and my 25-year-old son Ben was killed in a single-car crash outside of Bendigo, Victoria – Australia in November 2009. He was travelling at 140km with a blood alcohol reading of 0.08 when he hit a kangaroo, lost control of his vehicle, and struck two trees. I said to Ben once, that if he kept up his risky driver behaviour, I might have a police officer knocking at our front door. 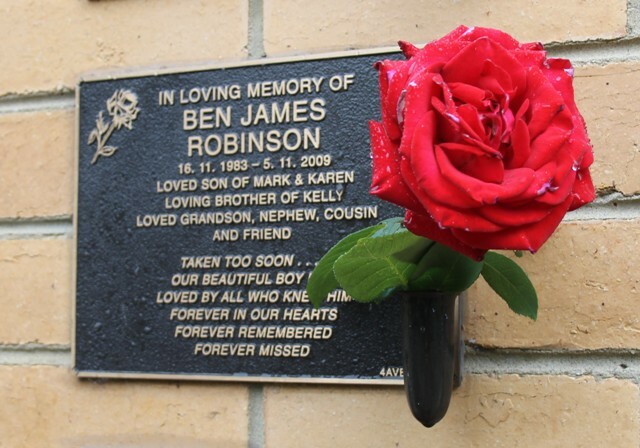 Unfortunately, that day did come, where our family received the news of Ben’s tragic death, via our local police. Our family want drivers, and all road users, to think about Ben’s story in the hope that they will be safe and responsible drivers. Ben’s story is a reminder that from the very first drink you consume compromises your ability to make good decisions. Whilst it is difficult to tell Ben’s story on behalf of my family, knowing that by sharing our family’s road trauma experience, can and does, help others understand better the importance of road safety. It can help save lives and prevent serious injury caused by road trauma. 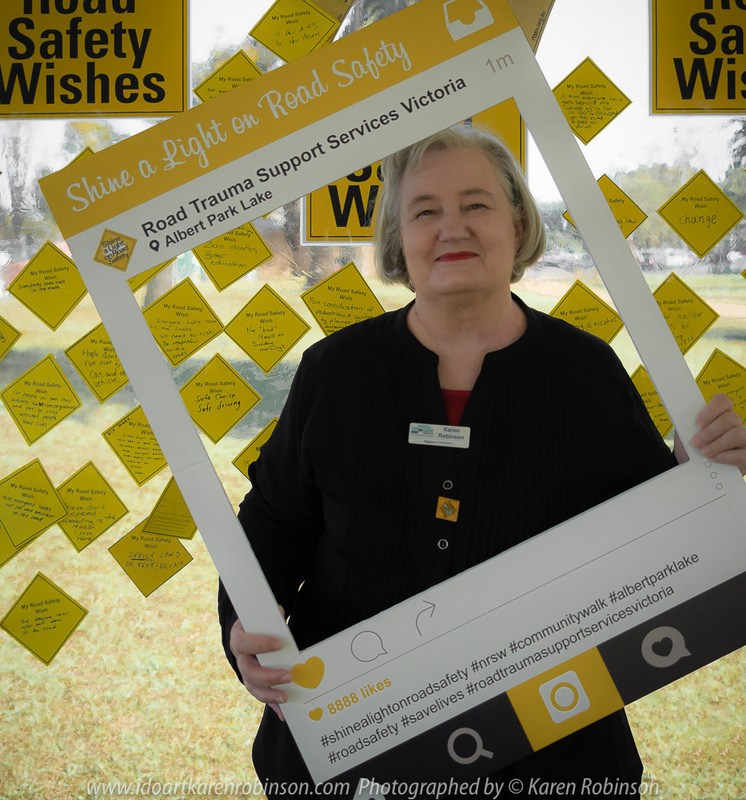 “Road Trauma Support Services Victoria’s Shine a Light on Road Safety campaign is to raise awareness, to stop deaths and injuries on our roads and to raise funds to support those impacted by road trauma: #shinealightonroadsafety (RTSSV 2018)”. Friday 4 May motorists are asked to turn on headlights to remember those impacted by road trauma and show your commitment to road safety (RTSSV 2018). Sunday 6 May there is a community walk at Albert Park Lake to enable community participation in advocating for safer roads (RTSSV 2018). Australian landmarks will be illuminated in yellow for road safety from Monday 30 April to Sunday 6 May; thanks to the support of key partners including the Victorian Government, the Transport Accident Commission (TAC), VicRoads, Victoria Police and campaign sponsors (RTSSV 2018). Our counselling and support services are available free and unlimited to anyone impacted by road trauma (RTSSV 2018). Road Trauma Support Services Victoria “is a not-for-profit organisation contributing to the safety and wellbeing of Victorian road users. We provide counselling and support to people impacted by road trauma, and address attitudes and behaviours of road users through education. We are committed to educating the community and raising public awareness about road trauma and how it affects people’s lives; we do this in part by sharing personal stories about road trauma (RTSSV 2018)”. 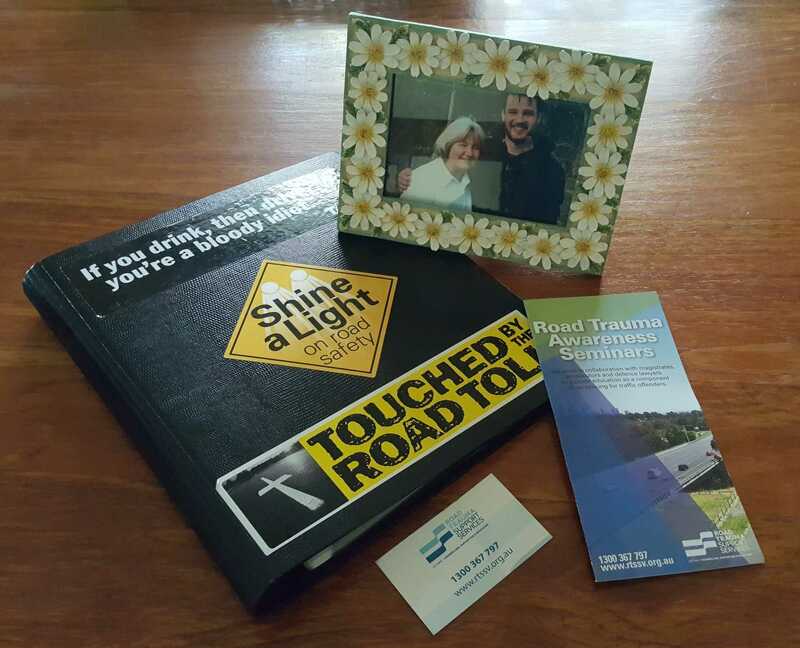 Shine a Light on Road Safety – Road Trauma Support Services Victoria – Get Involved! While you are here – please check out my About page! I wrote the following poem as a personal response to the dreadful news of the truck attacker in France, whom had killed over 80 people and seriously injured many others, nearly 24 hours after a Bastille Day celebration. This continual onslaught against innocent men, women and children going about their daily lives – is just devastating. To all those whom have lost loved ones, my deepest condolences; and to all those experiencing serious injury, may you have a speedy recovery. And to those whom experienced this horror directly, may you find peace as time marches on. It's so dreadfully hard not to be torn down by the daily news. Reading, listening, seeing the world horrors just gives me the blues. Did it get jarred away by us -- us being the human race? as they hear of this once beautiful planet. Was it all just a myth? that somehow they will do much better -- better than we have today. Image No. 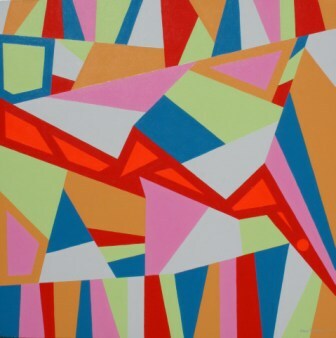 1 – Art & Creative Writing ‘The Art of Peace’ by Karen Robinson – Abstract Artist 20-12-2014 Acrylic Paint on H.W. Paper. By clicking on the image above, it will lead you to a blog I wrote about my own country’s terrifying and violent siege at the Lindt Chocolate Cafe in Sydney’s Martin Place – Australia. The above image I created in response to that event and is a representation of our world floating in a sea of darkness. Written by Karen Robinson NB: All images are protected by copyright laws. 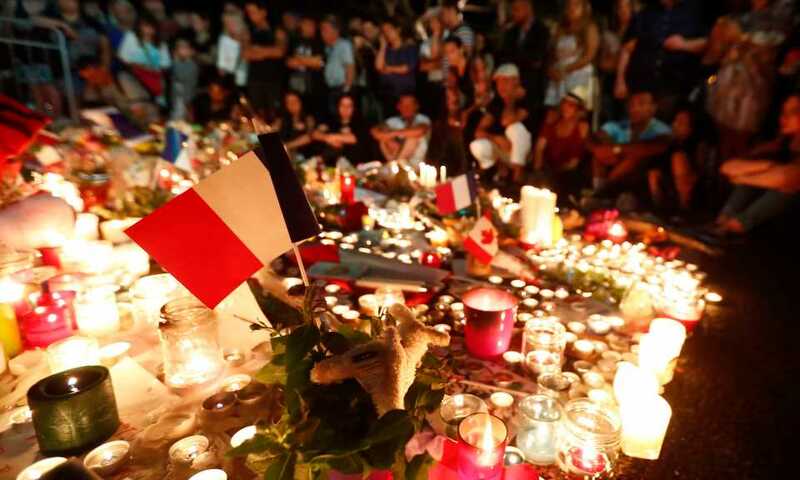 The Paris multiple attacks where more than 120 people were killed and more than 350 people were injured with about 100 of those seriously – via a series of coordinated terrorist attacks, was shocking news. The tragic loss of loved ones, family, friends and workmates must be unbearable for those directly impacted and for the people of France this needless atrocity must be impossible to fathom. The amazing resilience of the France people had inspired me to write this very short and simple poem. 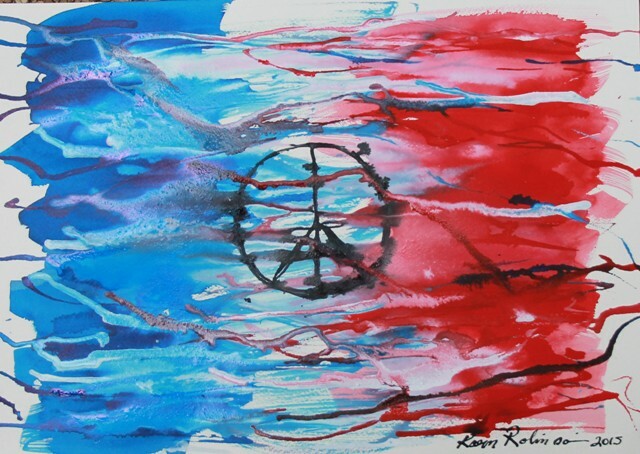 I have also accompanied it with an ink painting I have created which represents the French flag colours and I have used the now iconic symbol being ‘Peace for Paris’ which has spread around the world. I humbly and respectfully share my words here below. It’s that time of the year again, a time that marks another year where my husband and I especially on this day, the 5th November 2015, take a drive to Fawkner Memorial Park to pay our respects to the memory of our son. Over the last five years, each of these days have been strangely beautiful amongst the extraordinary array of fully bloomed roses. Each year signifies, that our choice of Memorial Park to place our son’s ashes was the right choice, as it serves as our quiet place to think of Ben and how much we miss him so. To ponder about, what it would have been like, if he was still here with us today! 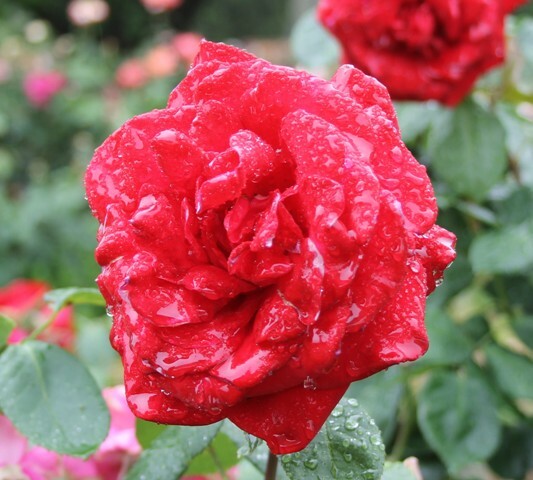 I found myself saying out loud to my husband “Look, the roses look like they are crying…”. It felt profound to make such a statement and perhaps it was just a reflection of how I felt in my own heart right at that particular moment. On my return, I wrote the below poem to mark the 6th anniversary of my boy’s death. 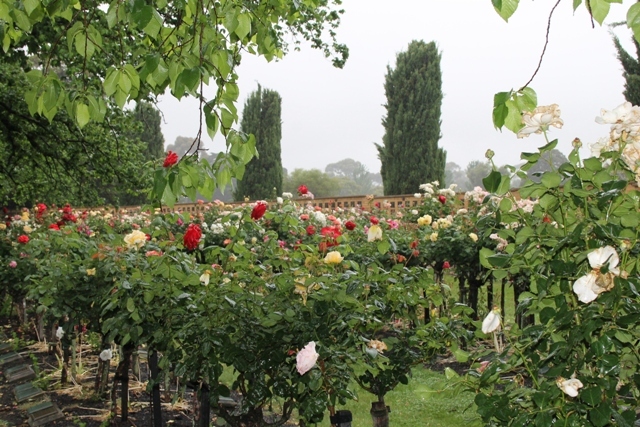 It’s raining and the roses look like they are crying. It’s been 6 years now since the passing of our son. We often think why -- why did he have to be the one. and always on the 5th of November. the one we now look towards, in our family, to be the mortar. and our endless love for her will always be a must. This month being our seventh group art therapy session and our third group project session, we continued to work dutifully on our individual works. Once completed, all participants artworks will be grouped together. This unity of artwork will then become a representation of ‘what it is like to be a carer of a love one who has been somehow impacted by mental health issues’ and ‘how being a carer for said has impacted on our lives and the lives of others within our families’. NB: To view details regarding previous stages – please click here. 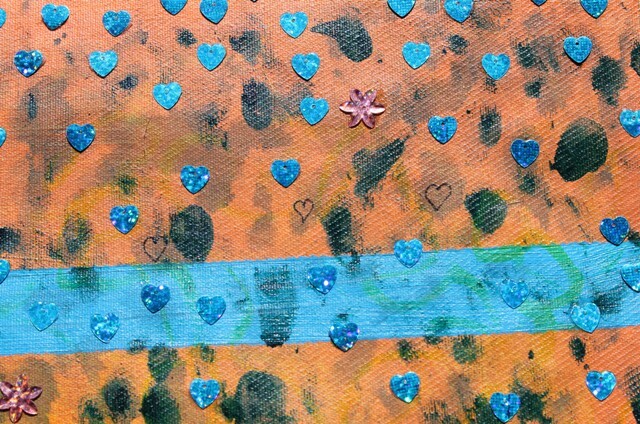 During this session, I decided to add little bright blue love heart sequins to the top of my painting. These love hearts are representative of all the tears that I have shed over the loss of my son, tears of love. I used a wooden stick with craft glue at the end of it and ran the tiny love heart sequins across it to catch just enough glue that would ensure the sequins would adhere to the canvas. The craft glue dries clear so it didn’t matter much if a little ran over a bit at the sides onto the canvas itself. On my return home to my studio with my art work, I decided to write a string of words around the outside of the large pink heart in black felt pen. As the words are very personal, I wanted the viewer to become very personal with the artwork its self, so I deliberately wrote the words very small so that the viewer of the artwork would need to go up to it very closely to read the words. These are the words: “Try to build in my heart the best of those I love, my darling dear husband whom I treasure, who has been so good to me throughout all the years of our marriage; my sweet, loving, caring daughter who is strong and gentle to her parents at the same time, my sister whom I have shared many troubles with – we are still talking; and my son gone but never forgotten – we miss you forever”. 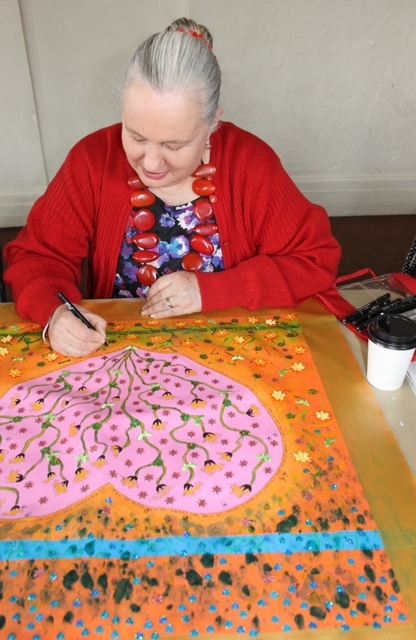 A Symphony of Joyful Artist Endeavour – Butterflies, Flowers and Glitter! After the above process was completed and had throughly dried, I decided I want to add small green and pink flower shaped sequins, small green satin butterflies, orange with yellow on top beaded satin flowers and green glitter to the stems of the flowers. It became a symphony of joyful artist endeavour which I really enjoyed doing. Once I felt I had added enough of the flower sequins, satin butterflies and flowers, I signed and photographed the artwork. I will now give it a coat of varnish to help preserve it. Once dry it will be ready to take back to our next session where we are going to be discussing how we will bring all the participants artworks together to exhibit – details will follow once finalised. Finished Art Work – yet to be titled! 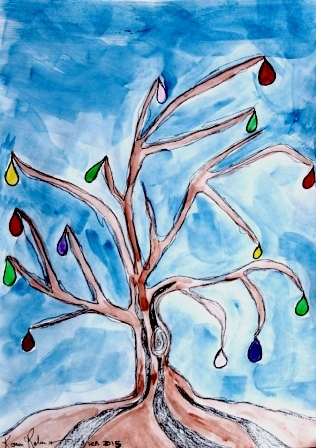 Whilst the painting is now finished and awaits the last part of our art therapy group project to be completed – we will soon have the creative writing facilitator come into our session and help us write a story about our paintings. NB: For the purposes of this weblog series “Art Therapy Group Sessions 2015“, I will not be mentioning any names or personal details of participants or even the name of the organisation that runs the sessions. Individuals have the right to privacy, so it will only be about my own experience – and broad statements about each particular session. I hope you will understand. Today was our sixth group art therapy session and our second session working on our individual works, which once completed, will be grouped together to form one single group work of art. NB: To view details regarding the first stage please click here. During this session, I decided to add a blue line across the top and a green line at the bottom of my canvas. 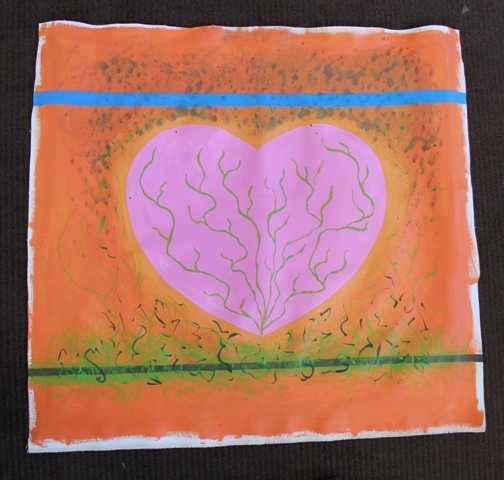 I then mixed a lime green paint colour and using a finely pointed paint brush, marked the inside of the heart shape, with stem like markings. Around the top where I had the blue line, I decided to mute the blue line by tapping over and around it with my black paint covered fingers on the canvas. At the base of the canvas, using a small finely pointed paint brush, I used dark green and lime green paint to make fine swirling lines and repeated the process with the colour orange/yellow around the base and along each side of the canvas. The finished effect can be see in the image below. After we had all completed this second stage of our individual pieces of art work, we all shared a little about our art work and only as much as we wanted to share. Some of us talked about the meaning of it, others talked about what they intended to do moving forward over the weeks to come. We were then given the option to either take our art work home with us to work on further or leave them at the venue to dry. I chose to take mine home to work on and to give me the opportunity to plan what I wanted to do further, during the coming weeks of our art therapy sessions. The next day, I decided to work on my art work further. Firstly with an ink pen, I outlined the green stems within the heart, and then draw in flowerets at the end of each stem line. Once this was dry, I then coloured in the flowerets with, watered down yellow ink which nicely dispersed within the flowerets shaping. In a couple of spots, I draw in mini flower bugs and small hearts. I decided to ink blotch the top end of the canvas further, to make a stronger statement. Once all this was dry, I pencilled in a boxing shape around the outer edging of the canvas, then use masking tape along the pencilled line and then painted it in gold, to frame the whole art work. The finished effect can be see in the single image below with close-ups in the follow set of images. 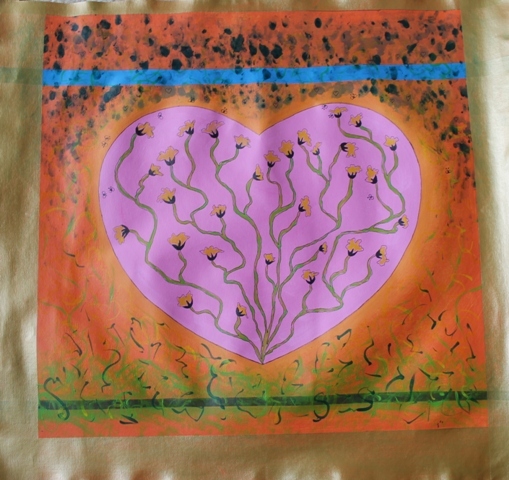 I am now leaving this art work to sit until our next art therapy session where I will then work on it further. Today was our third group art therapy session and consisted of a number of individual exercises. Here within this weblog, I have included just the one! For our first art for therapy exercise, we were asked to create a circular mandala that would be made up of a number of sections. Mandala means ‘circle’ in the Sanskrit language and is a spiritual and ritual symbol in Hinduism and Buddhism, representing the Universe. The basic form of most mandalas is a square with four gates containing a circle with a center point. It can be used as a psychological and educational approach to human development and offers a conceptual model for understanding how we can heal, develop, and transform consciousness (Mandala Symbolism). Each section of the mandala we were to make in this art therapy session was to represent something that was important to us as individuals on this particular day. We were given a sheet of paper and a large bowl which was used to create the outer rim of the circle. Materials supplied consisted of magazines that we could cut out selected images and paste onto the mandala, felt pens for easy drawing application, oil pastels, crayons and ink pens. I decided to work with some images from the magazines, and with ink pens and felt pens for quick, easy application. We had approximately 20 minutes to achieve but by the time we actually got started and completed the exercise, it was more like 40 minutes all up. After completing the task each of us in turn explained what our mandala was all about. Above is an image of my whole mandala and below – images of each section with an explanation of its meaning for me. Mandala Section 1 – ‘Mother Nature’ Important to me! My husband has create around our home a beautiful garden. Now 15 years on in its development, we have large mature trees and brushes that attract the local native birds. Be in winter, spring, summer or autumn – our garden offers a slice of nature just outside our back and front door – good for the soul! Mandala Section 2 – ‘Coffee’ Important to me! When my husband and I were at the peak of our grieving process from the loss of our son, we would take ourselves out and find a quiet place to have a cup of coffee. It was a time where we found it hard to get out and mix with others. This coffee outing treat, helped us both feel that we were not alone, that we were still connected to the rest of the world. At times we would just sit, sip our coffee, read the paper, or just quietly take in what was happening around us. So having a cup of coffee out at a cafe’ was important to us and still is these years – it’s a small treat for us both. Mandala Section 3 – ‘Art for Therapy’ Important to me! The engagement of art for therapy in the way of abstract painting, creative writing and blogging is very important to me. It helps me everyday maintain a good sense of wellbeing. Mandala Section 4 – ‘Good Health’ Important to me! During the period of time when I was my husband’s carer, as he recovered from chemotherapy, and during the period of time where my husband and I were deeply grieving for the loss of our son, my personal physical and mental health declined to a point where if was beginning to shorten my life span drastically. My mental health has improved and my physical strength has returned. I am now eating better, walking each day and sleeping soundly. Good health has become a top priority for me to ensure I can live a long and productive life. Mandala Section 5 – ‘People in my life’ Important to me! More than ever before, the people in my life are essential to my existence as a mother, wife, friend, colleague, art therapy group participant, creative writing group participant and as a volunteer worker. All these people who I come in contact with, week in and week out, help to ensure I have meaning and purpose in my everyday. Mandala Section 6 – ‘Equilibrium’ Important to me! Everyday I look for equilibrium in my life. A balance between all of the other elements that may up my day. When things look like they are getting out of balance, I take a deep breath and reassess and look for the things that tick the happy box! 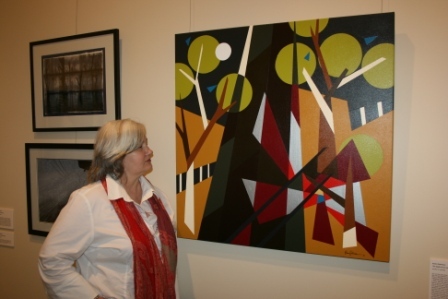 I have just become a member of Regional Arts Victoria. 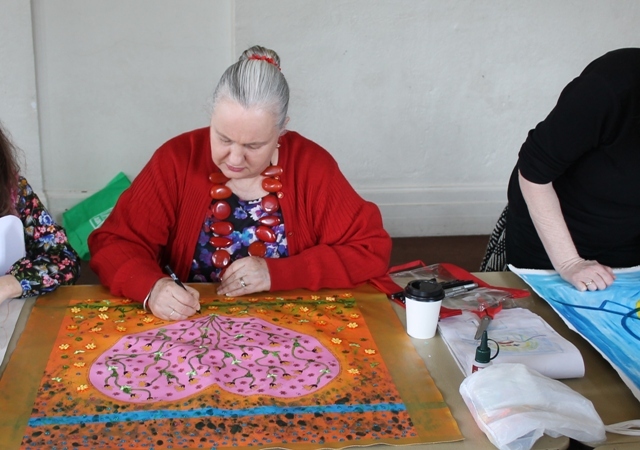 They “inspire art across the state of Victoria through creative facilitation, touring, education, specialised resources, artistic projects and advocacy. They develop and sustain creative communities and artistic practice” all over Victoria, Australia (Regional Arts Victoria 2015). Regional Arts Victoria are an “independent, not-for-profit, membership-based organisation working in long-term partnerships with every level of government, fostering contemporary and innovative regional cultural practice across five decades. They advise and impact on decision-making across multiple portfolios and levels of government. 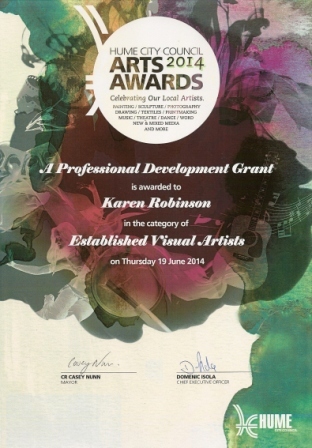 The organisation is the peak body for regional artists and arts organisations, and the leading organisation for regional creative practice in Victoria, Australia” (Regional Arts Victoria 2015). This is exciting for me and I am hoping that I will have lots to share through my blogging as I become more familiar with this organisation. 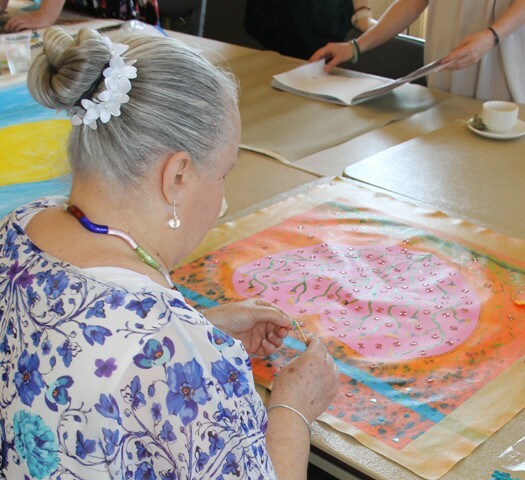 Art Therapy Group Sessions 1, 2, 3 and 4 – 2015 have been just as interesting and revealing as demonstrated in the first lot of group sessions I participated in during 2014. Being my second round of art therapy, I have been finding the sessions more enjoyable and less confronting. 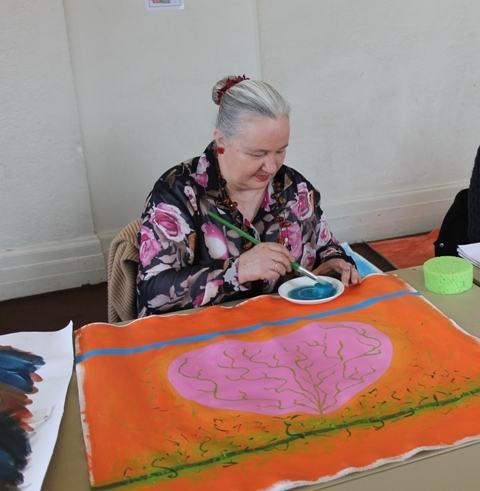 But I have noticed that for some other participants, being their first experience with art therapy, are at times finding the art therapy sessions emotionally challenging. For one of the art therapy exercises, we were asked to think about a problem we currently have in our lives. Once we had formulated this within our minds, we were then instructed to paint/draw it onto a sheet of paper. What came to mind for me, was a difficult relationship that exists between a family member and their young grown-up child and how this relationship has caused grief and despair for both parties over a long period of time. So I painted one black rectangle with a yellow circle in it and another rectangle in yellow with a black circle in it. This for me, was representative of how both parties had the same DNA, yet a huge chasm sadly exists between them. Once we had completed our drawing/painting, we were then instructed to tear and/or cut up the drawing/painting itself. This was a significant process and very symbolic. By tearing/cutting up our drawing/painting, we were effectively breaking up our problem into smaller, more manageable pieces to deal with. It also appeared to look different, hence giving me the opportunity to look at my own problem in a different way. An interesting process that got all the participants thinking that our problems can be approached in different ways, if we are prepared to take a different approach and perhaps instead of looking at a problem as a whole, that we take some time out to see it in smaller tasks that might be easier to handle – even if only part of the problem is solved with other parts left to resolved perhaps at a latter date. This next art therapy exercise involved taking a large block of clay, approximately the size of a square-shaped brick. We were then asked to close our eyes and start working the clay with our hands. We were asked to make something with it and I decided I was going to make something positive – I just didn’t want to have any negative emotions and feelings at work in this particular activity. We were given a period of approximately 10 minutes for this part of the process. I personally enjoyed moulding the clay but there were others that found it hard and didn’t enjoy. During the closed eyes part, I started making what I like to called ‘happy boxes’. I made a set of them and decorated the tops with a pencil. It was interesting to see what others had made and the symbolism of their work. For this particular art therapy exercise, we were asked to close our eyes and visualise sitting on a magic rug that was to take us on a ride. We were asked to imagine where the magic rug was taking us and to imagine where its final destination would be. Some of the participants’ magic rug journeys were sad, emotional and distressing, others had journeys that were pleasant and comforting. For me, I had a good journey across the grass fields opposite where I live, across homes and gardens within my suburb. My final resting place was within my own home garden. My dear husband over 15 years has grown from bare earth, a beautiful Australian Native Plant garden and it offers both of us in our autumn years, much joy and peace. This was a very interesting art therapy exercise. We were handed a set of cards. These cards each had an individual image. We were required to take a card from the pack without sharing the image on the card with another and then partner up with the person next to ourselves. Each partner was required to describe the details of the card to the partner, without the partner seeing the card. The partner was required to draw from this description on a sheet of paper. Once each partner had completed the task, we all showed our cards, shared our experience and drawing with the group. This for me, was a process that really required a great deal of trust in another. It required a degree of understanding that at times, we need to surrender our desire to want to control all circumstances. I didn’t have a problem with the task, as I trusted my partner, to do her best to inform me of details that would enable me to complete my drawing from her description. I also noticed that I wasn’t too concerned about how different my drawing might be from her card. I really just enjoyed the process but I did see and understand that some others struggled with letting go and just taking it as it comes and not getting stressed out because it didn’t look the same as the card image. It was a very good activity about effective listening, communicating, trust, understanding that we cannot always be responsible for another’s actions, we can only be responsible for our own. What was firstly revealing was how little we had listened to the instructions first up. How we really needed to have paid attention to fully comprehend what seemed like simple instructions. Another revealing factor was that most of us preferred the last of our images being No. 4 – drawing with dominate hand without taking the pen off the paper. Our last activity for session 4 was a group activity based on producing a group mural. I had, in 2014 participated in such a task and was familiar with what to expect, which did help me prepare myself to just enjoy the process and not be to ‘precious’ about my artistic endeavours. We were required to paint/draw an image and then think about how it could be connected to the person’s art work, either side of ourselves. I was happy with my image, which I did in paint with bold orange fence posts, out lined in charcoal with two runs of charcoal barbed wire running through them. As I stared at my art work, I realised that it could be the fence posts and the barbed wire that could be the connecting theme running through the whole mural work. For me, I found the task enjoyable. My only concerns during the process was to ensure I had consulted properly with the rest of the group to ensure they were going to be happy with what I proposed as a way of connecting all our individual art works, for my part. Some of the group were apprehensive about having another mark their part of the mural work but after some general conversation, they came to appreciate that it was a group work of art and as per the instructions given by the art therapist we needed to ‘give and take’ during the group mural task at hand. All group participants in my group got the idea and all individually went about adding in their personal contribution to the other participants mural art work sections. Over the course of participating within these art therapy session for 2014 and 2015, it is very clear to me that it is not about the art, but about what we are thinking and how we apply that thinking to the art work itself. 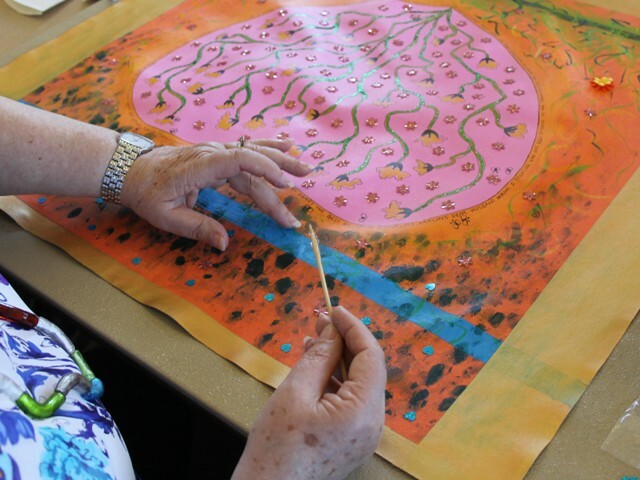 The art therapy process can present as a challenge for some participants. Some, also find it hard to let go of the fact that their art work is not a representation of being a good artist or not; and struggle to make an open acceptance that it’s about self exploration; that the art work is just a vehicle that is used to achieve that outcome. It’s Christmas Day and early in the morning. The streets are quiet and no one seems to be out and about, perhaps still snuggled in their beds. The birds are awake and busily chirping, and the sun is hiding behind some clouds. The morning is not cold and hints at a warmer day ahead. Once my husband has risen from is bed and our family dog has had his daily walk, we will firstly set out to visit Fawkner Memorial Park to pay our respects to our son, as it will be now 5 years since his death and five Christmas’ we have not had him here, in our presence. I try to take lots of photos on these occasions. Photos are important to me as they capture small pockets of memories that can be revisited, when the memory fails to recall, these ever so special moments. 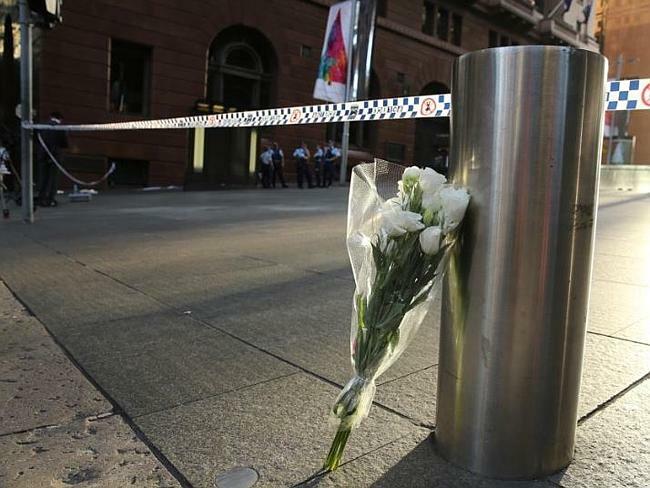 My blog this week could not be about anything else, other than the terrifying and violent siege at the Lindt Chocolate Cafe in Sydney’s Martin Place, where two people lost their lives and where others were severely traumatized. In keeping with my creative writing process, I have written the following in response to this disturbing and worrisome event, for which Australians have to date, been mostly protected from in comparison to the rest of the world. Our resolve as a nation has not been tested like this before and it has left us shaken and questioning our future – as a once known safe place to live. We have been known as ‘the lucky country’ and we are, and we must remain just that… Below is a short essay on my thoughts, of what has become in the minds of Australians, a monumental event. Title: The Art of Peace! “What does the ‘art of peace’ look like? It looks like this! 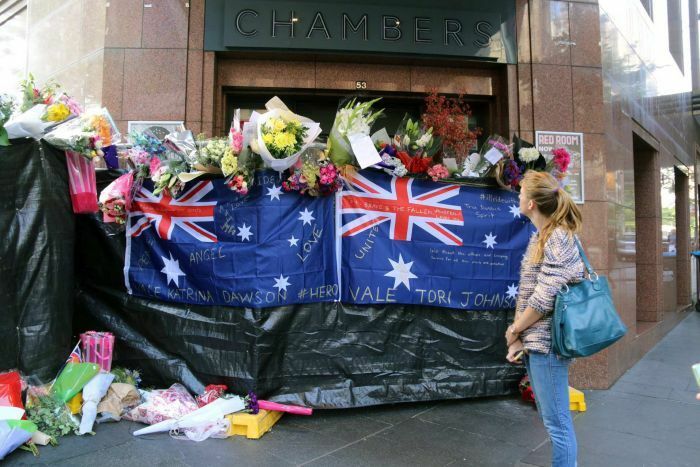 It is a people who show their outpouring of grief through peaceful assembly where they lay flowers as a sign of respect; and a desire to show that they care about their fellow Australians. The way in which Australians have responded to this terrible happening, has never made me feel prouder than now, to be an Australian. 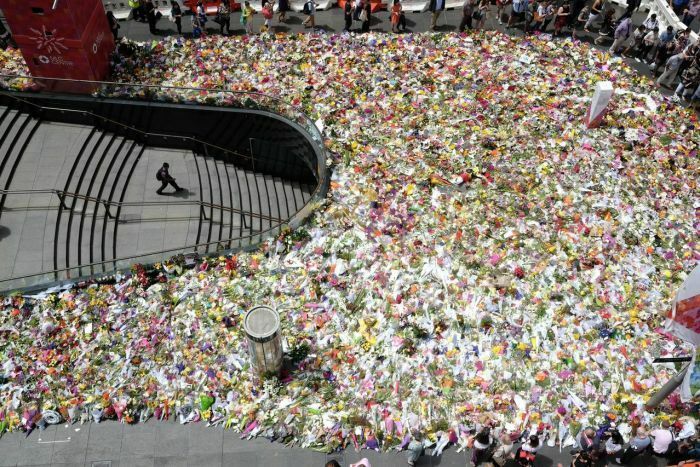 The show of solidarity through a peaceful, caring and very touching way, the placing of thousands of flowers at Martin Place, has been deeply touching. Over the course of time, I have painted a number of works of art that express may reactions to social, environmental and political events around the world. I felt a strong desired to mark this dreadful tragedy and incredible outpouring of Australians grief with an abstract painting. Again I wanted to use my creative writing piece to inspire an art work and is featured below titled ‘The art of peace’. I have called it the art of piece and not the act of piece because I believe there is a real art to creating peace. That it takes far greater strength of character to create peace than it does to create a violent act. This is a small piece of art work which I have done on HW paper using acrylic paints. I plan to do a larger art work of said on canvas, a meter x a meter for a forthcoming exhibition mid 2015. 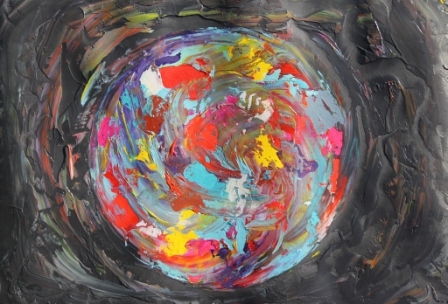 The blackness as shown in the background of the painting, is our deep and dark universe and the circular shape is our earth. The multiple colours are representative of all the coloured flowers layed at Martin Place as a sign of respect by many Australians. The motion within the painting represents how the news of the tragic event and the amazing outpouring of grief demonstrated in the laying of the flowers, sweep the world… The blurring also is representative of a strong desire of a peaceful amalgamation, a peaceful unity of humanity in order that we can all live on this planet together for future generations. My sister informed me this week that she had sent flowers to Sydney from Melbourne from our family…I was really touched by this act of peace…. As creative writing participants, we are now just past mid way through our journey within this group. It has been an interesting process so far – learning about what sort of writers each of us are and how much we differ in our writing approaches. What has been most interesting, is hearing each other’s writing voices through the sharing of our stories each week. For our last week’s homework creative writing piece, we were asked to write about ‘words that have helped ourselves get through something‘. After some reflection, I wrote about the words I found to help me through my greatest loss – the death of my son Ben. I called it ‘A Time to Remember’. 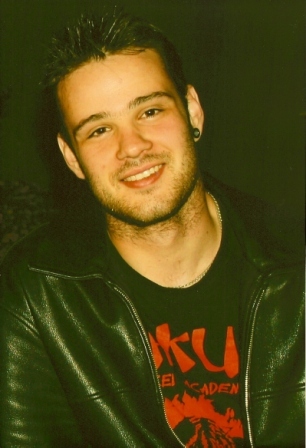 “There was a time in my life, where there were no words that could help me after the loss of my son Ben, who was killed in a single vehicle car crash on the 5th November 2009, at the age of 25. I found myself searching for some way to be able to want to move forward, to find meaning and purpose in my life, to find some small measure of joy in every day. In early 2010, I had decided to do volunteer speaking with an organisation that uses volunteer speakers, to tell their family’s road trauma story to repeat road traffic offenders, in the hope that by hearing the volunteer speaker’s personal story, their words, would help these drivers to rethink about their risky driver behaviour. I am an avid photo-taker and have realised over many years now, that photo-taking has given me an opportunity to record important family events and moments that other wise would be lost in my memory archives, as I age. Taking photos ensures I have a picture story to forward onto my family’s future generations. There have been many, many happy moments captured in this manner. 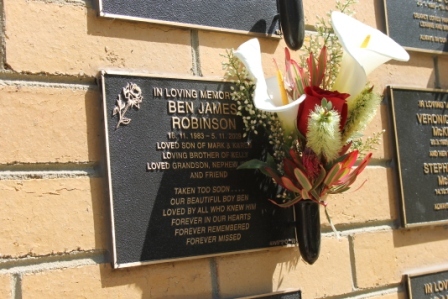 So it is not a surprise that I would also capture moments my family share, when we do our yearly pilgrimage to Fawkner Memorial Park; to take moments out to think about our Ben. Again I wanted to use my creative writing piece to inspire an art work and is featured below titled ‘A Time to Remember’. They are not ‘master pieces’ but are an important part of a therapeutic process that I enjoy and helps complete my art for therapy journey after each creative writing group session. My ‘art as therapy’ journey has allowed me to explore ways of being able to endear feelings, thoughts and emotions about family members dearest to me into my abstract paintings. 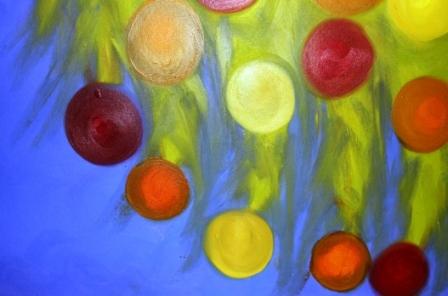 During 2010, I had painted a series of paintings which were done with my darling dear daughter in mind. In the year before, 2009 Nov 5 her brother, my son had been killed in a single vehicle car crash. Much of my paintings over this period of time had been about the loss of my son, about my grief and despair. It was hard to think about anything else at that time in our family lives. During 2009/2010 my daughter and her then partner, now husband were building their new home; building a new life for themselves to share together. I decided to do a series of paintings for my daughter; below is the first in this series. I needed to paint with joy in my heart instead of grief and despair. Painting for my daughter was a joyful experience and helped me to look forward into the future. Another example how ‘art as therapy’ helped me in my journey. Painting No. 47A – Title “Road to a New Life” Apr/June 2010 – by Abstract Artist: Karen Robinson All images are protected by copyright laws! Painting No. 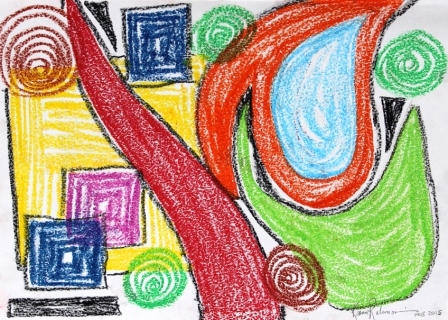 47B – Title “Road to a New Life” Apr/June 2010 – by Abstract Artist: Karen Robinson All images are protected by copyright laws! The Matisse Paint colours I chose to use for this painting, were heavily influenced by what I understand to be some of my daughter’s most favourite colours. The earthy colours are a direct link to the colour of bare, just freshly turned dark rick soil, being the plots of land awaiting housing construction. The grey representing newly made roads leading into the new estate. 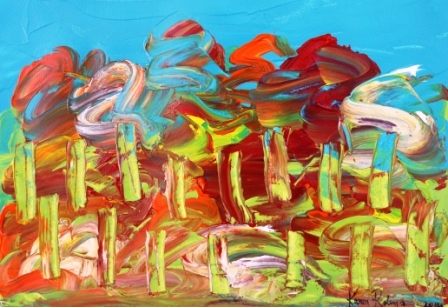 The blue is one of my daughter’s favourites and it also is representative of the expansive beautiful, big blue sky that can be seen within the region where the estate is being established – just outside of Melbourne, Victoria – Australia. The fine bands of silver and gold running across the paintings are representative of the wealth of goodness I find in my daughter…in her soul and heart. 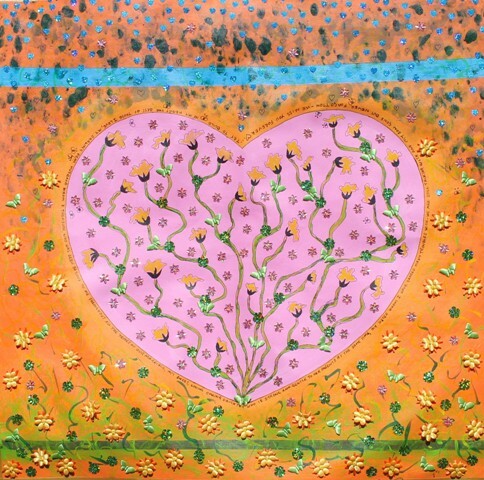 Painting for my daughter at this particular period of time in my life 2010 was an important moment. I was looking to find hope and a way to find joy again in life. My daughter became this beacon of light and as it should be…thank you my darling, dear daughter…. What is ART? – It enriches your soul and gets you thinking! What is ART? Well for me, it is a means of being able to communicate with myself and with others, emotions, feelings and thoughts. It is a voice that can reach into our hearts and souls; it can reach out across oceans. Art can convey powerful messages, points of view, challenge our beliefs and attitudes; and it can change the way we think. It can take us back in time and also it can transport us into the future. Art can invite us into unknown magical worlds of others and it can, at times be like a ‘slap in the face’ by being troubling and confronting. Art takes us on a journey and then returns us back to where we came from but on our return we are a little richer for the experience; whether a viewer of art or an artist. This is what art is for me. Please find here in this video below titled “Using art for therapy” – myself talking about my own art for therapy journey. When I firstly watched this other video following below “what is ART”, I was so impressed by the freshness of these artists’ take on what art is! Each of their statements resonated with my own personal experience of what art has been and has become for me. It was not until I got to delving into the details of the video further that I realized that these participants of said, are actually theatre artists and not painters. 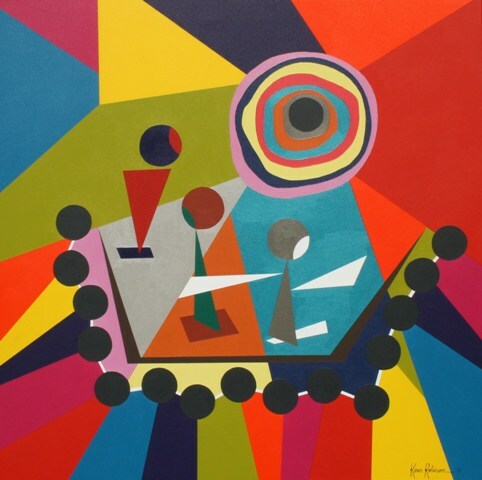 I was surprised that what they had to say about “what is art?” from their perspective, as theatre artists, rang just as true for me, as an abstract painter; so much so that I felt it was a good summation to share! These are their words about “what is ART?”…. “art is an agent of change”; “anything that highlights life”; “they know it’s an art form when it has a story – when it speaks to them”; “art is an expression of the soul”; “the product of the reaction to something you love”; “and passion”; “and anything in-between”; “it’s the highest form of language”; “it’s got to be honest”; “a vehicle for expressing your thoughts, your emotions”; “we can’t keep it, we need to share it”; “if it’s not shared – it’s just a work of a crazy person”; “for me art is important because it makes you think”; “I like the idea of creating something out of nothing”; “think about how to improve your own life and the lives of others”; “to have something in the world that exists that affects people”; “it is what allows us to feel”; “without it we are nothing more than robots”; “just rocks”; “if you don’t have art – you merely exist”; “art draws out the humanity”; “art elevates existence into something else”; “we are able to inspire and move people into action”; “it’s your way of sharing and giving back to the people”; “without art life would be boring”; “everyone should have some sense of creativity in their lives”; “it is not beautiful without art”; “if you have a point of view your are an artist”; “an artist is someone who sees things that no one else sees”; “with the mindset of moving the society forward”; “anyone could be an artist as long as you are honest”; “courageous”; “art makes you sensitive to things around you”; “to allow growth in our lives”; “a reflection of the beliefs and the desires”; “it pushes me to improve everyday”; “makes me appreciate all the little things”; and “art is everything”. This video campaign, as shown below, is produced by Mayk Juat, Jake Macapagal, Pam Imperial and directed by Mayk Juat and the Cinematography by Nix Lanas. They state that it “aims to take a closer look on how the arts can be applicable to our lives” and is “expressed by those who live, breathe and LOVE it – the Filipino Artists” (What is ART – maARTe ako, 11 Jul 2011). Spoken by Theatre Artists:- Robbie Guevara Actor/Director; Ana Abad Santos Actress; Carlos Canlas Actor/Singer; Stephanie Reese Actress/Singer; Joel Trinidad Actor/Playwright; Reuben Uy Theatre Actor; Bea Garcia Actress; Casisa Borromeo Actress; Jake Macapagal Actor; Jenny Jamora I’m a Human Being; Topper Fabregas Ma ART e ako; Pam Imperial Ma ART e ako; Raul Montesa Ma ART e ako; Astarte Abraham Ma ART e ako; Teresa Herrera Ma ART e ako; Kakki Teodoro Ma ART e ako; and JM Rodriguez.